The Operational Guidelines for Responsible Land-Based Investment are now available as an e-book for tablets and e-readers. USAID is increasingly partnering with the private sector through efforts such as the New Alliance for Food Security and Nutrition (New Alliance). Some of these initiatives, particularly in the agriculture sector, involve land-based investments in countries where land governance is weak. In these environments, investors face land tenure risks associated with unclear or overlapping claims to land, lack of transparency, and land-based conflict. 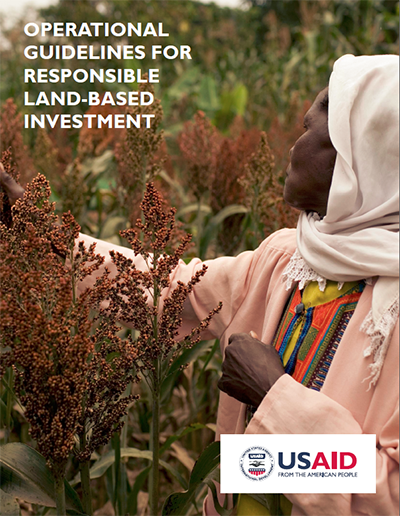 This guide, Operational Guidelines for Responsible Land-Based Investment, discusses USAID’s recommendations for best practices related to the due diligence and structuring of land-based investments, with the goal of reducing risks and facilitating responsible projects that benefit both the private sector and local communities. This guide is also designed to help companies identify practical steps to align their policies and actions with provisions of the Voluntary Guidelines on the Responsible Governance of Tenure of Land, Fisheries, and Forests in the Context of National Food Security (VGGT), the International Finance Corporation’s Performance Standards on Environmental and Social Sustainability (IFC PS), and other relevant instruments, including the United Nations’ Guiding Principles on Business and Human Rights (UNGP). This guide does not endorse large-scale acquisitions of land. USAID strongly recommends that investors consider smaller-scale projects or alternatives that avoid or limit the transfer of land and resource rights, such as contract farming and smallholder out-grower schemes, in place of large-scale investments. Increasingly, research shows that these alternatives can lead to positive economic and social outcomes. This guide recognizes, however, that large-scale land acquisitions are occurring, and will continue to occur, and in this context provides advice and highlights best practices related to structuring such acquisitions in the most sustainable way possible. The recommendations are organized to follow the lifecycle of an investment, from the initial stages of conducting due diligence and assessments, to pre-project community engagement, to negotiating the contract, project operations, and post-project close-out. At different stages we note “break away” points—situations that, should they arise, may be a signal that the risks of the project outweigh the benefits, and that it is better to terminate negotiations or close a project. Although the primary audience for this guide is a private sector company operating in one of the ten New Alliance countries, this guide is intended to more broadly inform land-based investments made by private sector companies operating in developing countries (and in particular, Sub-Saharan Africa). The questions and approaches described in this document are intended to help investors to not only “do no harm” when they acquire land, but to structure projects to achieve positive outcomes for affected parties. They are also intended to help investors adjust or amend corporate policies and processes in order to reduce land tenure risks and increase opportunities for sustainable and responsible investment in the agriculture sector.